So are you a gambler? Do you work the odds? Do you gamble sometimes and not others? Do you take gambles occasionally but only calculated ones? If the answer is you NEVER gamble then this is not the article for you but most of us do from time to time if the circumstances are right or we just want to be entertained and for you I would recommend you read this. First as the TV industry likes to call them "the up fronts"
You have all seen the hype around multiple internet marketing schemes. Make $10,000 a month for life with no recruiting. Work an hour a week from the beach and never work for the man again and so on. There is an old saying "if it is too good to be true it probably is" and the old saying is true. I am not going to tell you any of that. I am not even going to use the word investment. What I am going to do is tell you about a "gamble" I just made, why I made that gamble and then leave it up to you. This is not a hard sell. Is it me telling you you might - note MIGHT – be able to benefit from this? Yes it is - I will talk about MY decision and the simple math and logic behind it - not the company hype - and then I leave you too it. People always say do not work with friends or family, don't sell cars to them and so on - it can cause too much grief. I am telling those I know about this; I am also going to suggest my wife does the same [she may or may not do so - that is her decision to make]. Do I have a vested interest - honestly yes - BUT and I stress this - they are right about family and friends SO - if I did not think MY math was correct I would not be putting this out to the people I know. You have all heard of Ponzi Schemes and you have all heard of Multi Level Marketing. They are actually quite similar - both depend on a few people recruiting a lot of people and supplementing the income of those at the top with the money coming in from those further down. There are however also two crucial differences. Multi Level Marketing is legal and Ponzi Schemes are not. Multi Level Marketing involves a product that is paid for and Ponzi Schemes do not. In essence a Ponzi scheme says give me some money and I will pay you interest on it. That interest comes from the next person who joins and so on. Eventually there are not enough new people to join to pay those already in the scheme and so it collapses - remember Bernie Madoff. With a Multi Level Marketing program there is a product that people buy. In addition you recruit people to not only buy the product but also to recruit other "sellers". Everyone makes money on the sales of those below them. That may sound like a scam but there are actually highly successful and well respected Multi Level Marketing companies out there - anyone ever seen one of those hideous pink Mary Kay cars? The bottom line is Multi Level Marketing is legal, it is not [in principle at least] a scam and people do make money at it. How Does Multi Level Marketing Work? Basically all schemes are built on a single common principle; a matrix is the normal term used but you can call it a tree, a pyramid or whatever you like. 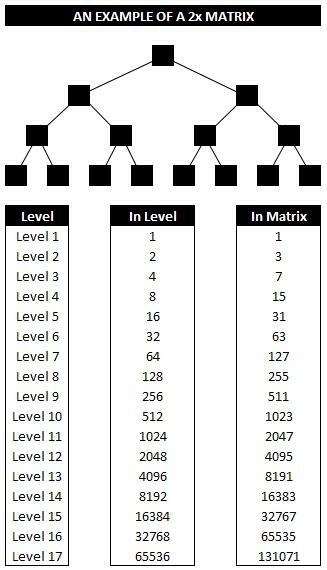 The picture illustrates what a matrix would look like with the company at the top and then expanding down through the levels. Note the numbers and how they grow from very small numbers to very big numbers. That is crucial and you will see in a little bit why that is what this is all about. There are several ways to make money out of the internet. Come up with Facebook or Google - OK that's been done - unless you happen upon the next mega idea that probably will not happen for you. Make money from writing and content, I do that in a very small way [and I do mean SMALL] though I hope to grow it over time and you are not likely to get rich doing that. Make money out of Multi Level Marketing - there is a new Multi Level Marketing program every month or two on the web if not more often. FACT - if NOONE ever made any money they would not keep cropping up - ergo - people do make money - but who and how? The answer is locked up in that matrix we just looked at and in timing. You have probably heard the phrase “timing is everything”; in this case it is the whole basis for my decision; it is the reason I have taken the gamble I have and it is the reason I am telling you about it. Consider the matrix and its levels. It needs only 1023 people to fill it down to Level 10, to get to level 17 you are looking at over 130,000. Multi Level Marketing programs will pay you a commission on your down line, they are all different but in the case of this example they pay to 12 levels [14 if you buy an annual subscription but more on that in a little bit]. So to get the maximum payout you need to fill your "matrix" that means thinking of your position wherever that may be a being the top of the matrix and then building a pyramid under yourself. Easy - not at all - I know a few who have done it, one in particular [our up line and team partner in this gamble] gave up "working for the man" in 2001 and has made a fine living since then with just this sort of program. However most of us are not equipped with the nature or tenacity to recruit huge numbers of people and so we never fill a matrix and never make the big bucks. And anyway if I join after 130,000 people have already joined then we need a quarter million to populate the next level and pretty soon we need more people than there actually are on the planet. The best Multi level marketing programs might get close to a million members but certainly not more and more commonly they are lucky to reach half a million. What does that tell you - timing timing timing - what if I am in the first few hundred, what if I am even higher than that - look at the matrix again and the numbers higher up - now maybe there a chance to come close to filling your matrix and making the big bucks. I have joined and worked to one extent or another many of these programs over the years. Here and there I have a made a little money but mostly not. In the end I figured this math and decided that the only way was to be in right at the beginning when the numbers were small enough to give you a fighting chance - it was the only way the math would work. Then along came the chance I had been waiting for - I heard of a new program and was able to get in on the first day! 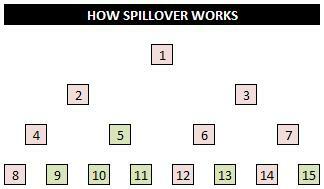 What Is Spillover & How Does It Help Me? Take a look at this diagram. Pinks [sorry yucky color out of Excel – did not notice until I had generated and uploaded the image and I could not be bothered to go back and do it again] are filled positions and greens are vacant. At the top of the tree is #1, the big honcho, el grande heffe; he is the master recruiter but hmmmm - he can only have two people directly underneath him - what happens when he recruits someone else - the answer is simple - they get placed in the highest available position in their enrollers matrix - in this case position 5. But look what happened for the person in position 2 - they just got a recruit - but they did not recruit them. Number three recruits someone - the only place they can be put is in position 13 also benefitting position 6. What happens if #1 recruits another 6 people - now #5 has both his spots immediately under him filled but he did nothing. Now Multi level Marketing companies have always talked about spillover; most will tell you can make all the money you need without recruiting because of it - but think about it - you are in level 17 - there are a quarter million spots in the next level - how much spillover will you really get - timing timing timing - we just looked at the top where the numbers are small and my math says that there at the top spillover does work - the math says so - if you have the luck and timing to be in the top few levels math says it really is possible [note possible not definite] that your matrix could be filled with little or no recruiting by yourself. Companies will use the concept of a Powerline to woo people to join as paid members - all a Powerline is a list of people in the order in which they tried out the site or joined the program, it means nothing and pays nothing, it’s a recruiting gimmick in a way though it does lock in the order in which people are moved to the matrix. Then at a predetermined time those who "joined" are allocated spots in the matrix based on the rules we already discussed effectively leap-frogging over people who tried out but did not yet join. They get join at the higher levels and we have talked about what that means. The rule of thumb needs to be this - if you are going to do it now is the time - if you are not - no biggie - it is your decision to make. As I said earlier having spent several years believing my math and logic is sound and that the only real way to make money out of a Mutli Level Marketing program was to be in at the start I finally got that opportunity and I took it. Partly because I do believe the math and that I will make some money [might only be a little, might be a lot - it is a CALCULATED gamble not an investment] and partly simply to validate my math and logic - prove myself right or not if you like. What I do know is this - this is the best chance I have ever had – if I make no money this time from Multi Level Marketing I never will. The outlay is relatively small - $50 and $10 a month [or $140 up front which gets you paid two levels further down the matrix and saves you $30 on the full year]. Is it a sure thing - no - is it a gamble - sure - but it is a well thought out and mathematically viable gamble. How many of you visit a casino every now and again - they did not build casinos on winners. Do you go out to eat once a week or so - that money adds up? The outlay is, I say again, relatively small when set against the POSSIBLE return. The program I just joined pays $8000 a month on a full matrix for an annual enrollment, $2000 for a monthly. Is that what I expect to make, no, but it is possible based on logic and some sound math - in two weeks time it will not be - there are a couple of thousand paid up members in the first week or so, those numbers will grow and fill the viable levels quickly. What I do expect though is this – I genuinely 100% EXPECT to make at least my stake money back along with a little more – I DO NOT expect to be out of pocket. Having said that note this – like all gambling [and in my view true “investments” also] you should use ONLY money you can afford to do without. I will not be in trouble if I lose the $140 – might be unhappy but I will not suffer. If you have no interest in this possibility at all then thanks for reading, think me a fool if you so choose and have a great day. If you feel like joining me in my calculated gamble this is where to go. You should note we talked about the Powerline and the cut off when people are assigned matrix spots - the FIRST cut off for this program is this coming Friday - if you fancy taking the chance your odds are at their best by Friday - after that the numbers just get harder. If you have a little interest but are unsure and have questions feel free to get in touch with me through Facebook, the Contact Form Page, or email me. You could also take a look at the support Facebook Group where questions are asked and answered sometimes more quickly than emails can be answered; the group’s membership includes the top recruiters, trainers and motivators associated with this program. Take a chance or not - up to you - out of interest I will post here from time to time [likely the first time will be this coming weekend after the matrix assignments] with updates on how it went and whether my mathematical theory and logic that caused me to take this chance was correct or whether I need to go back to school. Yes mlm is like gamble but if you deal with it in a professional way, then mlm is the best business funda that can be used to market any product of the world. So I Am Of "Below Average" Intelligence!